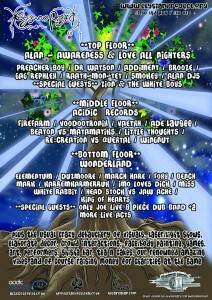 Yes yes, Adam Re:Creation has kindly asked me to play alongside him next month at the mighty Elysian Project in London. We’ll be spinning on a fat psybreaks and psydnb/neurofunk type tip, though I suspect we may hop around the genres more than that 🙂 The night offers three rooms with a hugely diverse range of music from both live acts and DJs… click on the flyer to see it full-size. Sign up on the Facebook event page. If you want any more details, full line-ups etc you can get them on the Elysian Project site. Note that early bird tickets are available at £7.50 for a few more days. It’s £10 on the door, which is pretty fantastic for an all-nighter!